Nowadays, the internet has grown into one huge information vault. For college seekers applying for financial aids to getting and taking a course online can now be accomplished. One can get an online degree from a school that offers online education as a suitable alternative to going to school and attending classes personally. Studying online and going to a traditional school is different. There are differences in methods of teaching and not all can study online or go to a class. 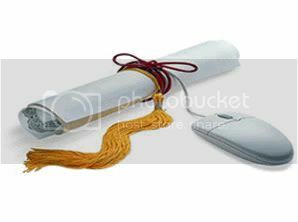 If you are working but want to continue school and graduate from college eventually, then you can take the online education. Though some people can be a working student, others might not have the luxury to even go to a real school. You see, with online education, you don’t have to be physically present to attend class. You can access your materials needed via the internet. This is a great way for those who are already tired from work and just want to relax by reading some of their course work. He won’t have to commute to school after work and or he will be just sleepy and tired and can’t concentrate on what the teacher is saying. This form of learning is flexible and easier for some. There are issues whether a student can get the same valuable education if he takes an online course. Some professionals who has taken distance learning says that they actually learned more than when they were in school. This type of learning worked for them because they can study at their own pace. Nowadays, employers have come to respect and accept online degrees. They see no difference in the amount of education as long as the applicant can prove to them that they can deliver. There is an increase of students attending online courses. Discipline and self-motivation is highly needed when attending online classes. Help and support are also available from teachers and other students via a group discussion or one on one. Overall, online degrees are becoming an increasingly popular way to obtain a college education and many students are turning to online education because of the quality of material, convenience and the level of flexibility inherent in distance education programs. Because there’s no distinct differences between an online education and a traditional education, students are assured they are receiving the same kind of education that they would in a brick and mortar setting. There are definite benefits to online degree programs, and students with discipline and motivation can and will succeed greatly in online education programs.